This book is designed to help you focus on the issues related to your TTM and related conditions. It is aimed at recreating sessions which have been developed into a protocol and which are widely used by hypnotherapy professionals and counsellors. The contents of this book are aimed at you working through them either alone or with support of a trusted person in your life. There will be good days and bad days but each time your hair stays in place, see it as a triumph. 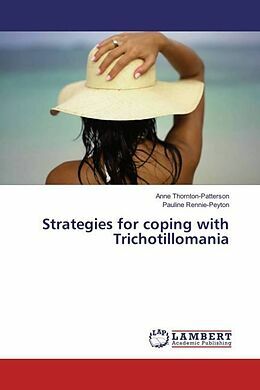 Since 2000 I have worked with hundreds of men and women who have suffered the distressing and debilitating condition of Trichotillomania. I decided to write this book to enable people to be their own therapist as I am constantly receiving enquiries from sufferers via the internet from all corners of the world.